If all goes well we are hoping for puppies in 2019. 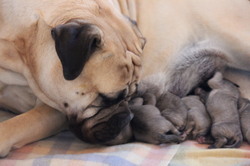 ​If you are interested in purchasing one of our puppies please go to the contact page to provide us with your details. ​​We do require a puppy enquiry form to be completed so please do not be offended by any questions we ask because it is essential our pups go to loving forever homes.